Historical fiction is one of my favorite genres - I just love the way it transports you back to another place and time. As I wrote recently, Kirby Larson's Hattie Big Sky was one of my favorite audiobooks ever. And so I was thrilled to read Larson's new sequel, Hattie Ever After. It's a chance to revisit an old friend and see where her journey takes her. This is historical fiction whose character shines with heartfelt spirit. When you get to the end, you'll be sure you've made a friend for life. We left Hattie on the plains of Montana, having spent a year trying—and failing—to make a home for herself and "prove up" on her claim. I've always admired Larson for not making a sweet ending for Hattie. Life was hard on the plains, and Hattie struggled mightily. As we re-enter the story, Hattie is now 17 and working as a cleaning woman in a boarding house in Great Falls. But Hattie still yearns to carve out a place for herself. She's got big plans for herself: throwing "a lasso around a dream even bigger than a Montana farm,” she has decided to become a reporter. Hattie leaps at the opportunity to go to San Francisco with a traveling acting troupe. The city draws her even more so, as she's sure she can learn more about her Uncle Chester - was he really the scoundrel he said he was? Nothing in Montana seemed to suggest that he really was. And though her childhood friend Charlie wants to marry her, Hattie worries that “saying yes to him was saying no to myself.” With her head full of questions, Hattie sets off for San Francisco in the summer of 1919. Larson hits her stride when Hattie reaches San Francisco. The city comes alive with the many details she weaves into the story. From her first glimpse of Newspaper Row, with the Call, the Examiner and the Chronicle Buildings all next to each other, to an exhilarating airplane ride over the bay, Hattie is like a little child soaking in every sight. Readers will cheer Hattie on as she steps into the Chronicle Building to apply for a job. Hattie has pluck and determination, realizing that she might need to start on the cleaning staff of the newspaper, but with a little luck and hard work she might be able to get a break. Larson builds suspense as Hattie makes new friends, investigates news stories, and gets a lucky break at the Chronicle. Throughout, she is passionate and earnest, following her dream. Many young readers who are drawn to Hattie's story will empathize with her dream of becoming a writer and making her mark on the world. If I have any hesitations about the book, it's because this is a true sequel. It took me a while to pull Hattie's story back in detail into my mind. I had trouble in the beginning with placing each of the characters. But once I settled into the flow of the story, I was absolutely hooked. We had the huge pleasure of hosting an event for local students to meet Kirby Larson and hear about how she researches her books. Tomorrow, I'll share some special moments from that wonderful evening. See other reviews at Teach Mentor Texts, Bookshelves of Doom, and Read, Write, Reflect. Also definitely read the interview with Kirby Larson at Read, Write, Reflect. If you're a fan, you'll also like the guest column Kirby wrote for Kirkus Reviews on how she achieved success. The review copy was kindly sent by the publishers, Delacorte / Random House. If you make a purchase using the Amazon links on this site, a small portion goes to Great Kid Books (at no cost to you!). Thank you for your support. "Determined!" "Independent." "Thoughtful." "He stayed true to himself." These were my students' words about Horace Pippin, an inspiring African American painter. 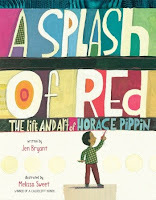 I loved sharing A Splash of Red, Jen Bryant and Melissa Sweet's new biography of Horace Pippin, with our 3rd graders. Pippin's inner strength and creativity shone throughout this book. 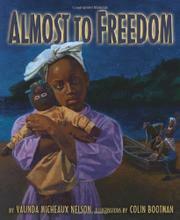 Share this book as you study African Americans and read about American artists. But most of all, read this book to connect with an inspiring individual. Born over 100 years ago, Horace Pippin loved to draw as a child - everyone asked him to draw pictures for them. But life threw many hard times Horace's way. He quit school after eighth grade to work and support his family. He fought valiantly in World War I, but he was wounded and never regained full use of his right arm. When he returned home, Horace's "fingers itched to draw all the colors and textures he saw," but his right arm was too weak to lift. Bryant shows young readers how Pippin, through sheer determination, learned how to draw and paint again, using his left hand to guide his right. My students were filled with hope and inspiration as they heard about how Pippin stayed true to his dream and visions, even though painting was difficult for him. One of the aspects that really stuck with my students was that Pippin thought carefully about his paintings before he started drawing, because the act of drawing was so difficult. I loved how Melissa Sweet hand-lettered quotes from Pippin throughout, giving readers a real sense of his beliefs. The mixed-media illustrations convey Pippin's warmth and spirit, combining drawings and printed elements with watercolor and gouache paints. Melissa Sweet writes in her illustrator's note that she was "inspired by Pippin's deep, rich colors." Like Bryant's words, Sweet's illustrations fill readers with a sense of Pippin's heartfelt artwork, simple on the surface but thought through at every step. Finish reading this by taking a careful look at the end matter and endpapers. Bryant and Sweet each write insightful notes and provide helpful resources for further reading. We ended wanting to learn more about Pippin's work. This video, created by students in Philadelphia, lets students see many of Pippin's paintings. Find more resources at the website A Splash of Red. "Bryant’s meticulously researched, eloquent text makes this a winning read-aloud, while Sweet’s vibrant, folksy illustrations, rendered in watercolor, gouache, and mixed media, portray the joys and hardships of the man’s life, using his trademark palette…with just a splash of red." The review copy was kindly sent by the publishers, Alfred A. Knopf / Random House. If you make a purchase using the Amazon links on this site, a small portion goes to Great Kid Books (at no cost to you!). Thank you for your support. Students at our school are fascinated to learn about the Underground Railroad. We use historical fiction and nonfiction to pull our students back in time. Three picture books stand out for me, because of the way that they help young children feel the tension and drama of this time in history. 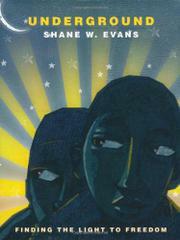 With sparse text and powerful imagery, Evans brings young readers into the world of a family escaping from slavery. A family gathers to escape, only their wide eyes showing in the blackness of night. They run barefoot through woods, at each step watchful for the patrollers looking for runaways. 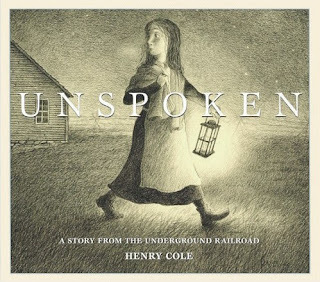 Use this powerful picture book as an introduction to the Underground Railroad. Evans' powerful illustrations help young children put themselves in the situation, connecting with the intense emotions, drama and tension of the experience. Young Lindy fiercely clings to her rag doll, Sally, through hard days and nights with her family as slaves on a plantation. The doll Sally tells this story, sharing how Lindy's mama Miz Rachel made her out of "no more'n a bunch of rags" and carefully stitching her face on. When Lindy's father is sold after trying to escape, Lindy hugs Sally "so hard I think my insides'll bust" - and young readers will know how much this doll brings Lindy comfort. Sally tells of the night when Lindy and her mother escape to freedom, meeting their father and crossing over the river. Sally's voice is at once familiar and colloquial, helping readers connect emotionally to the story. I particularly liked the way that the doll helped readers understand the frightening situations that children went through, while emphasizing the hope and comfort family can bring. This wordless book makes you think at each step of the way, as you unravel and make sense of the story. A young girl crosses to the barn to do her chores, and she's startled by a noise in the corn husks. But as you look more closely at the corn, you realize that a person is hiding among the stalks. The young girl courageously brings food packages out to the barn, but the two never speak. She knows it's a tense time - she's seen a group of mounted Confederate soldiers pass by, and bounty hunters bring reward posters to the farm. As the pieces of the puzzle came together for my 2nd graders, they were amazed at the young girl's kindness and courage, and the runaway slave's daunting challenge escaping to freedom. We talk all the time about "reading is thinking" and Henry Cole asks his readers to do just this. On our first read, some of my students were frustrated that we never see the full face of the African American hiding in the corn stalks. But as we talked about it today, those same students talked about how much this story stayed with them. Cole's pencil drawings evoke the girl's emotions and the setting of Civil War Virginia, creating tension and mystery within this quiet book. The review copies came from our school library. If you make a purchase using the Amazon links on this site, a small portion goes to Great Kid Books (at no cost to you!). Thank you for your support. Hooray for the Cybils!! Winners are announced today! "If some la-di-dah awards can be compared to brussel sprouts, and other, more populist ones to gummy bears, we’re thinking more like organic chicken nuggets. We’re yummy and nutritious." For the past two years, I have had the great honor of working with the Cybils team to organize the Cybils Book App Awards. We have carefully considered over 80 nominated books apps, looking at storyline, interactive features, narration, illustrations, and overall child appeal. This award stands out for considering the literary merit of book apps, not just their technical achievements. What would you paint if you had a magic paintbrush? Would you paint all the riches you might want? But what might happen if an evil lord tries to steal this away? Dragon Brush takes children into this scene, using interactive features to draw children along but never overwhelming the story. 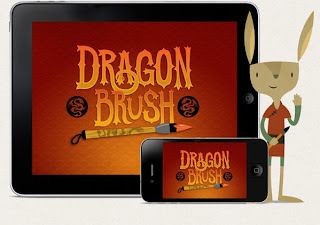 Dragon Brush embodies all that the Cybils stands for: an excellent story that draws children back to it again and again. Children are fascinated with the interactive features, revealing the intricate paintings that magically come to life, and finding each of the hidden inkpots. I want to send a special thanks to our wonderful team of judges: Alyson Beecher, Sara Bryce, Helen Dineen, Carisa Kluver, Elisabeth LeBris, Lalitha Nataraj, Cathy Potter, Melissa Wiley and Paula Willey. Each one added thoughtful comments and we all learned so much from one another. I feel lucky to have so many colleagues throughout the blogging world helping me explore this wonderful world of book apps. All of the Cybils winners are fantastic. Take some time to peruse this wonderful resource and find great books to share with your kids. Read about other book apps here on my blog, Great Kid Books. Today marks the Year of the Snake in the Chinese calendar and I would like to share a special book, Crouching Tiger by Ying Chang Compestine. This book particularly spoke to me about the ways a grandfather reached out to his grandson, stretching across cultural differences. Compestine's story rings true for many families, and it is one that children will appreciate. Like many boys, Vinson loves martial arts and is eager to show off his fastest kicks and punches. When his grandfather visits from China, Vinson watches his grandfather practice the ancient art of tai chi. "His hands moved like gliding birds. He crouched like a tiger; he drew an invisible bow; he lifted a foot like a rooster and stood still." Vinson wants to learn tai chi himself, and his grandfather starts by teaching him a standing meditation. This quiet, disciplined form is definitely a challenge for Vinson, and he almost gives up. He can't understand how tai chi build strength. But when his grandfather brings him to the New Year's parade and asks him to lead the dragon with the cabbage, Vinson is full of awe and respect for his grandfather. Compestine captivates young readers with this portrait of a family's cultural identities, as the generations reach out to one another. She conveys young Vinson's embarrassment and growing respect for his grandfather as he comes to see and understand him. The illustrations are quiet, until the climatic scenes, matching the narrative journey nicely. 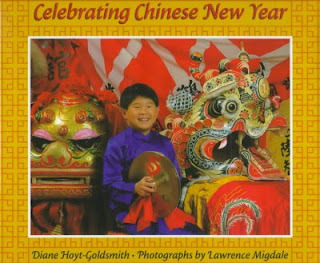 Combine this with Diane Hoyt-Goldsmith's nonfiction Celebrating Chinese New Year, which follows Ryan, a young Chinese-American boy in San Francisco, as his family prepares for Chinese New Year. 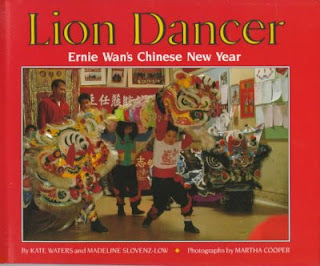 For a simpler book, look for The Lion Dancer: Ernie Wan’s Chinese New Year by Kate Waters and Maeline Slovenz-Low, which shows how 6-year-old Ernie performs his first lion dance. In simple, easy-to-read sentences, Ernie describes the way he and his family prepare for Chinese New Year. While the photographs are not very crisp, this book is still engaging and worth seeking out. 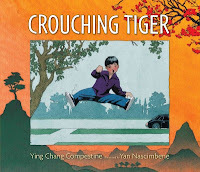 The review copy of Crouching Tiger was kindly sent by the publishers Candlewick Books. If you make a purchase using the Amazon links on this site, a small portion goes to Great Kid Books (at no cost to you!). Thank you for your support. I love historical fiction. I can absorb the feel of a particular point in history, and truly gain an understanding of the events. I'm thrilled that a sequel to one of my favorites, Hattie Big Sky, is about to be released. So I'd like to share excerpts from my original post in 2009. We're thrilled that Kirby Larson is visiting the Bay Area for the release of Hattie Ever After. You can see her at Book Passage, in San Francisco, or Rakestraw Books in Danville. In 2009, my 10 year old and I really enjoyed reading/listening to Hattie Big Sky, by Kirby Lawson - a story that shows what it would have been like to try to "prove" a homesteading claim in Montana. We can't wait to find out what happens next in the sequel Hattie Ever After, being published next week. We're **thrilled** for the release of Hattie Ever After. Larson follows Hattie's journey, seeing where this young girl's dreams will take her. If you're excited for the sequel, take a look at Kirkus Review's starred review. 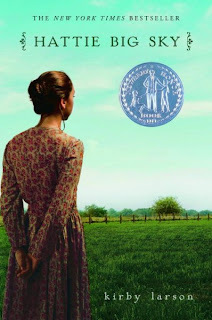 I completely agree: Larson writes "historical fiction with heart." This review was originally written in 2009 for this blog - one of my early reviews! And yet, Hattie Big Sky is a book that's stayed with me year after year. The review copy came from my public library. If you make a purchase using the Amazon links on this site, a small portion goes to Great Kid Books (at no cost to you!). Thank you for your support. I write a monthly column for Parents Press, and this month they're focusing on pregnancy and newborns. So I thought we'd share about baby animals! 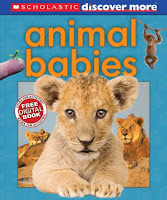 My students adore reading about baby animals, and this is a great way to entice young readers. Here are three nonfiction books our students have really enjoyed. For more, head over to my Bookshelf column in this month's Parents Press. Utterly adorable photographs of newborn animals will bring “ooohs” and “ahhs” from kids of all ages. But I love the clear text that provides interesting information on animals ranging from an Asian elephant to the tawny frogmouth (a bird with a very large mouth). 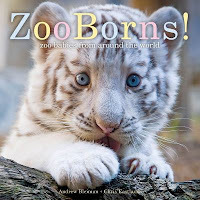 Also check out the easy readers in the ZooBorns easy reader books from Simon & Schuster's Ready-to-Read Level 1 series - great for first and second graders to practice reading nonfiction on their own. With bright design, colorful photographs, interesting sidebars and basic diagrams, Scholastic’s new nonfiction series introduces young readers to a range of topics. Animal Babies includes sections on hatching, metamorphosis, getting around and survival strategies. Large headings and short sentences make this a good choice for new readers trying out nonfiction. The panda kindergarten class at China’s Wolong Nature Preserve will elicit smiles and laughter from your children as they watch the little panda cubs play on a seesaw, hang from a branch and chomp long pieces of bamboo. Readers will follow a day in the life of panda cubs at this nature preserve. 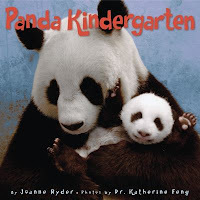 I particularly like the way the photographs and text complement one another, drawing children in and helping them learn about the efforts of conservationists to increase the panda population. If your children adore baby animals, make sure you check out more suggestion in this month's column at Parents Press. The review copies were kindly sent by the publishers, Simon and Schuster, Scholastic and HarperCollins. If you make a purchase using the Amazon links on this site, a small portion goes to Great Kid Books (at no cost to you!). Thank you for your support. Throughout America, our communities and families are becoming more and more diverse. I love sharing books that celebrate family history from a wide range of perspectives, because many of my students can connect to them. 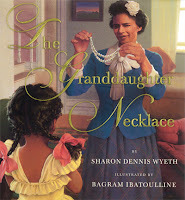 My students have especially liked reading Sharon Dennis Wyeth's new book, The Granddaughter Necklace, for the way it shares her discoveries of her own family history. Once long ago, a young girl sailed from Ireland wearing a necklace her mother gave to her. This necklace has been handed down from mother to daughter so they remember all of the women in their family. So begins this heartwarming story that traces a young girl's family story. The story then switches to modern time, as a young girl admires her mother's shimmering crystal necklace. Her mother then begins to tell her stories of her grandmother and all the other women in her family who had worn this special necklace. Going back, generation by generation, Wyeth shares a slice of her family history. Children get a glimpse of American history, immigration and family stories. Throughout, it has the feel of the oral stories that inspired Wyeth. Sharon Dennis Wyeth has always identified as an African American, but for many years she wondered about her family history. Through stories from her great-great-aunt and DNA testing, she discovered that her roots go back to Ireland and Africa. Baram Ibatoulline's paintings capture the blending of family backgrounds and races in a way that children will be able to understand, perhaps recognizing themselves or their friends in the portraits. My students, many of whom have family heritage from many continents, connect to this aspect of this wonderful story. We are celebrating African American history month throughout our whole school. I will continue to share some of the special books we are reading together. The review copy was kindly sent by the publishers Arthur Levine Books, an imprint of Scholastic. If you make a purchase using the Amazon links on this site, a small portion goes to Great Kid Books (at no cost to you!). Thank you for your support.